In the same way, the large atmospheric winds that circle the earth are created because the land near the earth's equator is heated more by the sun than the land near the North and South Poles. There are two types of wind machines (turbines) used today based on the direction of the rotating shaft (axis): horizontal–axis wind machines and vertical-axis wind machines. The size of wind machines varies widely. Small turbines used to power a single home or business may have a capacity of less than 100 kilowatts. Some large commercial sized turbines may have a capacity of 5 million watts, or 5 megawatts. A wind farm is a group of wind turbines used to generate electricity. Larger turbines are often grouped together into wind farms that provide power to the electrical grid. Most wind machines being used today are the horizontal-axis type. Horizontal-axis wind machines have blades like airplane propellers. A typical horizontal wind machine stands as tall as a 20-story building and has three blades that span 200 feet across. The largest wind machines in the world have blades longer than a football field! Wind machines stand tall and wide to capture more wind. Vertical axis wind machines have blades that go from top to bottom and the most common type (Darrieus wind turbine) looks like a giant two-bladed egg beaters. The type of vertical wind machine typically stands 100 feet tall and 50 feet wide. Vertical-axis wind machines make up only a very small percent of the wind machines used today. Wind power plants, or wind farms as they are sometimes called, are clusters of wind machines used to produce electricity. A wind farm usually has dozens of wind machines scattered over a large area. The world's largest wind farm, the Horse Hollow Wind Energy Center in Texas, has 421 wind turbines that generate enough electricity to power 220,000 homes per year. In 2006, wind machines in the United States generated a total of 26.6 billion kWh per year of electricity, enough to serve more than 2.4 million households. This is enough electricity to power a city larger than Los Angeles, but it is only a small fraction of the nation's total electricity production, about 0.4 percent. The amount of electricity generated from wind has been growing fast in recent years. In 2006, electricity generated from wind was 2 1/2 times more than wind generation in 2002. New technologies have decreased the cost of producing electricity from wind, and growth in wind power has been encouraged by tax breaks for renewable energy and green pricing programs. Many utilities around the country offer green pricing options that allow customers the choice to pay more for electricity that comes from renewable sources. 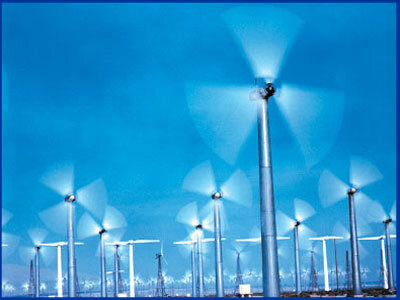 Wind machines generate electricity in 28 different states in 2006. The states with the most wind production are Texas, California, Iowa, Minnesota, and Oklahoma. Most of the wind power plants in the world are located in Europe and in the United States where government programs have helped support wind power development. The United States ranks second in the world in wind power capacity, behind Germany and ahead of Spain and India. Denmark ranks number six in the world in wind power capacity but generates 20 percent of its electricity from wind. In the 1970s, oil shortages pushed the development of alternative energy sources. In the 1990s, the push came from a renewed concern for the environment in response to scientific studies indicating potential changes to the global climate if the use of fossil fuels continues to increase. Wind energy is an economical power resource in many areas of the country. Wind is a clean fuel; wind farms produce no air or water pollution because no fuel is burned. Growing concern about emissions from fossil fuel generation, increased government support, and higher costs for fossil fuels (especially natural gas and coal) have helped wind power capacity in the United States grow substantially over the last 10 years. Sources: Energy Information Administration, Renewable Energy Annual2006, April 2008. Energy Information Administration, Green Pricing nad Net Metering, July 2008. The National Energy Education Development Project, Intermediate Energy Infobook, 2005. The American Wind Association, Wind Web Tutorial (http://www.awea.org/faq/index.html), 2007. The Global Wind Energy Council (http://www.gwec.net/), April 2007. FPL Energy, Plant Fact Sheets (http://www.fplenergy.com/portfolio/wind/plantfactsheet.shtml), July 2008. U.S. Department of Energy, Office of Energy Efficiency and Renewable Energy (http://www1.eere.energy.gov/windandhydro/wind_how.html#sizes), May 2007. 3)In 2006 wind energy was generated in how many states? d) from the uneven heating of the earth’s surface by the sun. c) is a group of wind turbines used to generate electricity. d) their negative effect on wild bird populations and the visual impact on the landscape.